Okay so I’ll be honest, from the first few pages I was unimpressed. I feel like Jakes idealizes, even idolizes Mary from the first few statements she makes about her. Saying that Mary birthed Salvation through her body just seems a bit far fetched for me. I also didn’t love that Jakes immediately addresses conception and the “biological miracle of pregnancy.” I just felt like this was misplaced in her overall story. The narrative itself is written in an interesting way as “letters to Mary.” I guess I had entered the book thinking we were really going to learn from the life of Mary, get to know her better but I felt this was lacking. Overall this was more of a story of Sarah Jakes as a mother and lessons she is learning; and some of those lessons were through the life of Mary. Others were lessons learned through Jesus’ life, Abraham’s story and so on. There were many quotes and ideas I can identify with as a mother, and lessons worth reading I just felt like overall the book was not what I was hoping or expected. I felt mislead by the tag line and in the end the cover art, which I did not love (thinking it did not reflect what the story was about) really was more telling then I’d like to admit. 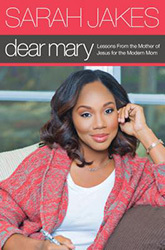 I feel like the image of Sarah Jakes would have been better suited for the back cover or inside flap and that they could have done something different to help current day mothers connect to Mary the mother of Jesus. But then in all actuality the book really was more about Jakes and less about Mary so maybe in the end it was suitable. I received this book for free from Bethany House for this review. I was not required to write a positive review. The opinions I have expressed are my own.